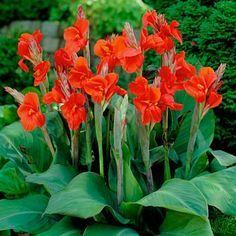 These Cannas will make an impressive focal point in a bedding display. A deep red (with fine yellow streaking at petals edge) clump of flowers with dark green foliage that grow just under 4 feet make it. The large blooms form an imperial spike that will add an exotic look to your garden. A pleasure to grow!